What is it about zombies that is so fascinating? The Walking Dead, a TV program now in its sixth season and the “world’s #1 show”, delivers a dystopic picture of a society beset by a virus that turns people into zombies. Its spinoff, Fear the Walking Dead, was a ratings winner upon its debut in summer 2015. Putting a new spin on an age-old plague story, these two shows build upon the premise that everyone somehow became infected, and that the virus lies dormant until death, when the corpse is reanimated unless a catastrophic brain injury is sustained. Drawing from this concept, the writers have crafted some intriguing twists and turns. Both shows have strong storylines and character development. Fans are rabid about the plot unfoldings, even when they diverge from the original comic books. Marketers have had a great run with all things zombie and rumor is some people are even reading again. So maybe it’s a lot of comic books but a range of zombie tomes has also joined the enviable list of beloved vampire and werewolf tales. Why are we so drawn to stories of apocalyptic horror? First, let’s get down to basics, which is our evolution and the role of dopamine in ensuring survival. There is plenty in this world to frighten us, particularly if there is an element of believability. For example, plagues have wreaked havoc with populations throughout history, which make them a favorite for spine-tingling storytelling. One of the most infamous is the pandemic that struck in 541 CE under Roman Emperor Justinian. Dubbed the Justinian plague because it occurred during the Emperor’s reign, it is estimated to have killed up to 50 million people. It was so catastrophic that “It’s thought that the Justinian plague actually led partially to the downfall of the Roman Empire,” says evolutionary biologist David Walker from Northern Arizona University. The plague laid waste to Europe, Northern Africa and parts of Asia. The bacterium Yersinia Pestis has been identified as the culprit, and is the agent that later caused the Black Death or bubonic plague in the 14th century. Spread by flea bites, it was deadly during times of limited hygiene, sanitation and scientific knowledge of pandemics and microbes. The Justinian plague ran its course and died out. The Black Death, though initiated by the same bacterium, arose from a separate event, showing the unpredictability of microbes in populations. Both plagues are thought to have had origins in China and Northeast India, and the same strain has been found today in such places as Arizona, although modern medicine and personal care have reduced the possibility of widespread infection. Listen to a National Public Radio segment on the Justinian plague and the discovery of a 1,500-year-old tooth that gave up the microbe’s DNA. For much of the world before vaccines, microbe research, antibiotics and medical interventions, sickness was an everyday fear. As you would expect, the sickest populations were often the poorest. Deficient nutrition, clean water and adequate housing contributed greatly to the spread of disease. And when life is difficult, when people feel whiplashed by fate, mythologies arise seeking a semblance of interpretation and control over what is happening. So it was with the zombie story. While today’s pop-culture depictions of zombies thrill us, the real story of zombies erupted from darker imaginations. The zombie mythology arose from the morass of French colonial slavery in Haiti. In the 17th and 18th centuries Saint-Domingue, as Haiti was called, was a French colony that was known for its brutality of African slaves. Typically half the slaves were worked to death within a few years, which necessitated a steady supply from Africa. For the slaves, the zombie myth became symbolic of their plight and as well, the promise of heavenly release. The original brains-eating fiend was a slave not to the flesh of others but to his own. The zombie archetype, as it appeared in Haiti and mirrored the inhumanity that existed there from 1625 to around 1800, was a projection of the African slaves’ relentless misery and subjugation. Haitian slaves believed that dying would release them back to lan guinée, literally Guinea, or Africa in general, a kind of afterlife where they could be free. Though suicide was common among slaves, those who took their own lives wouldn’t be allowed to return to lan guinée. Instead, they’d be condemned to skulk the Hispaniola plantations for eternity, undead slaves at once denied their own bodies and yet trapped inside them—a soulless zombie. The end of colonial rule didn’t inter this mythology into the back reaches of history. Instead, the archetype was folded into Haiti’s voodoo religion, which is still practiced in West Africa as Vodun, although forms of that religion vary greatly. Vodun was the name of the god of the West African Yoruba people who lived in 18th and 19th century Dahomey. Vodun’s roots may go back 6,000 years in Africa. It was brought to the Caribbean by slaves, who although forced to convert to Christianity, practiced their religion of origin in secret. The Haitian word “zombi” means “spirit of the dead.” As voodoo evolved, shamans or priests incorporated the idea of zombies into their practice of black magic and conferred upon themselves the ability to resurrect the dead. Sorcerers, known as bokor, used their bewitched undead as free labor or to carry out nefarious tasks. This was the post-colonialism zombie, the emblem of a nation haunted by the legacy of slavery and ever wary of its reinstitution. One scientist ventured into this underworld of black magic to determine whether human consciousness can indeed be suppressed by voodoo practices. Though different bokor used different ingredients in their powders, Davis found that “there are five constant animal ingredients: burned and ground-up human remains [usually bone], a small tree frog, a polychaete [segmented] worm, a large New World toad, and one or more species of pufferfish. The most potent ingredients are the pufferfish, which contain deadly nerve toxins known as tetrodotoxin”…. Davis’ findings have generated much criticism among scientists, although his identification of tetrodotoxin has been received more positively as having some scientific merit regarding symptoms. Indeed, there have been numerous tales of zombie sightings or experiences through the years in Haiti, but scientists believe that mental illness, superstition, brain dysfunction and other conditions are more likely factors in any supposed loss of cognitive functioning, not a zombie transformation. The idea of zombies has embedded itself into Haitian culture, but for many Haitians, these stories are fabrications and not to be taken seriously. Others consider voodoo a true religion and believe that the zombie myth desecrates the faith’s spirituality. But why do we love zombies? While undead creatures such as vampires and werewolves have magical powers, friends and adventures, zombies lead a “lifeless life.” And perhaps herein lies our fascination. We all fear leading a monotonous existence filled with boredom, emptiness, and loneliness: being one of The Walking Dead. Yikes. Zombies are scary enough without dragging our psyches into this. On the other hand, Dr. Friedman may be on to something. Maybe it’s time to get out and socialize. Anyone for trick or treating? 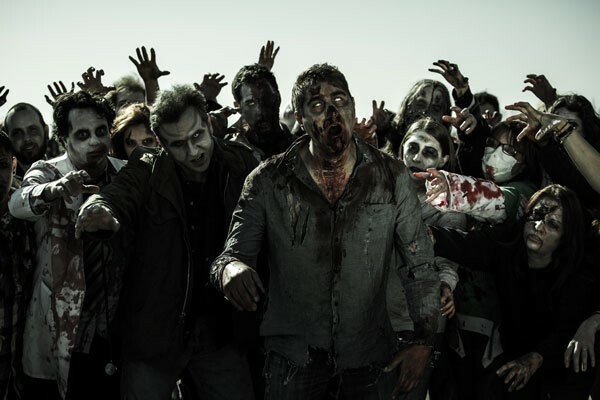 Look for Parts 2 and 3 of Zombie Apocalypse revealing how pop-culture embraced zombies and the ways people are using a zombie apocalypse for real-world emergency preparation. This entry was posted in Art, Biology, Blog, Culture, Public Life, Recreation, Science and Technology, Science Fiction, War and Violence and tagged ancient history, ancient plague, ancient zombies, AntiquityNOW, plague, The Walking Dead, vaccine, voodoo, zombie apocalypse, zombies. Bookmark the permalink.